I know what you’re thinking: this is a meditation site, why are you talking about gaming chairs? Well, we actually get a lot of visitors who are looking for floor chairs for a variety of uses beyond meditation. While a lot of floor chairs work perfectly for providing support for meditation, they aren’t comfortable for extended sitting while watching movies or playing video games. 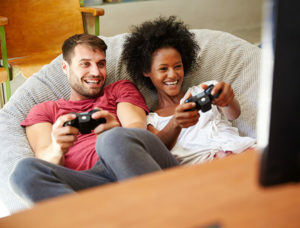 So for this article, we’re focusing on floor chairs that are good for gaming and other entertainment enjoyment. 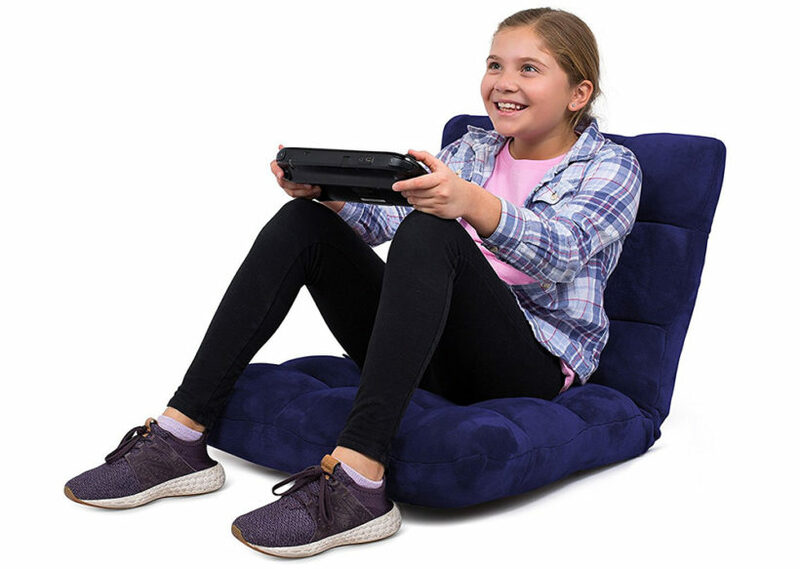 These gaming floor chairs are perfect to provide comfort for adults and teens while sitting on the floor. They’re great for family rooms, dorm rooms, or wherever else you play video games. Check out the recommendations below. While some of these chairs will work for meditation as well, we recommend you check out our article on meditation floor chairs with back support if you’re searching for a chair for meditation only. If you’re looking for a basic, but comfy, floor chair for gaming, this is a great choice. This chair features comfy cushions and 5 adjustable positions so you can find the perfect angle for optimum comfort. While this is a lightweight chair that is easy to store, it features a steel frame for durability an support. This floor chair is great for adults or teens to use while gaming, watching movies, hanging out, or even meditating. The microfiber cover is also easy to clean, so you can easily let your kids use it without worrying about spills. This is also perfectly sized and priced for a dorm room or teen’s bedroom. If you need more cushioning, more angles, and more colors options, you can get those with a little bit higher price from BirdRock. This plush gaming floor chair is super soft with a memory foam blend stuffing that creates a comfortable seat for even the longest gaming sessions. If you’re looking for back support while you’re gaming, this chair provides it with 14 adjustable angles. While we recommend this floor chair for adults, some reviewers say it is smaller than they expected. So if you’re a larger adult, look at the measurements before you order to make sure it will work for you. Otherwise, this is great for teens and kids and absolutely perfect for gaming. You could use it for meditation, too! If you really like to lounge, this is a great option for comfort on the floor. This gaming chair is more like a relciner with full back support and leg support. The metal frame provides a sturdy base and allows four 5 adjustable angles for the back support and three adjustable angles for the foot support. With a suede cover and the memory foam filling, this chair just feels good to sit on. This chair is so comfy you could fall asleep in it, so it’s perfect for gaming, reading, or just watching movies. For gaming, the armrests are perfect for resting your elbows. They’re also very convenient for relaxing with a book or watching a movie. This is a great, premium option if you’re searching for gaming floor chairs for adults or teens. This is a cool gaming chair. This ergonomic floor chair is designed as a rocker and curved to give you better posture while gaming. While the design is different from the other chairs we’ve featured, that’s not the only cool thing about this chair. It has built in speakers so you can get a surround sound-like experience while gaming or watching movies. Just plug into the chair’s AUX jack and you’re good to go. It’s also battery powered so you can use it anywhere without worrying about finding a plug. This chair folds over for easy storage and is reasonably easy to transport to a friend’s house for more gaming. This is a great option for adults and teens, though it may not work as well for children. If you want a little swivel to game time, check out this gaming chair. This is a comfortable floor chair for adults and teens that has a three position adjustable back. The really highlight is the swivel base, which can spin a full 360 degrees. This chair is great for group gaming or just getting the perfect angle to view the screen. The cotton cover is easy to clean and looks sharp in any living room, dorm room, or bedroom. When you’re done playing, this chair folds up for easy storage. But you’ll probably want to leave it out so you can enjoy it while watching TV, reading a book, or just hanging out with friends. Looking for more floor chairs? Check out the best meditation chairs.